Hate the thought of retuning to broken TV's courtesy of yet another blown lead/ blown coverage but nothing is forever in the NFL. 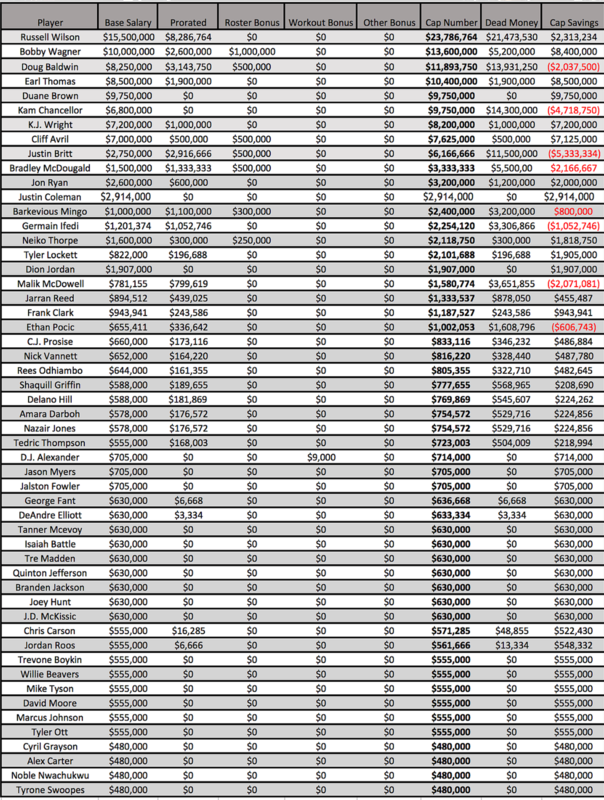 RS may reconsider his position, most of $11 milion is still an awful lot of money to leave on the table. There is going to be a run on Big Screens and Remotes this fall. Better start a Pemedic account now. Good point about the 4 5th's! Using the calculator, if we also cut Avril, Thorpe, and Ryan, 2018 cap space goes up to $41,467,600 (and up to a whopping $109,008,510 in 2019 if we do that and cut Kam after this season). We can get 2018 cap space up to $53,927,600 by also converting the 2018 salaries for Russ and Bobby in to bonuses. In other words, Seattle now has a ton of cap space and flexibility if they want to make big signings this year and/or next. If P&J want to go out and sign, say, Richardson, Norwell, and ASJ, they have the cap flexibility to make it happen. As the present situation is developing, the Hawks now are set up to be players in FA. You have to wonder if they will be though as the comp. pick scheme set up with the one year deals will not favour that for the 2019 draft. If they are locked to preconception then about comp. picks then FA will be slow. It remains to be seen if there still won’t be other surprising player moves with present roster members, like Thomas, if the right trade partner(s) can be found. The picture as to the FO direction is still not in focus. Next week will tell us a great deal more, expect more surprises. They now can certainly keep the guys they want and be in conversations for others. I’m unsure it will be necessary to cut Thorpe and Ryan and think if Avril is gone he will get a parting injury settlement so his number will be reduced by $1.5 million or so. You could be right about Avril, Thorpe, and Ryan though. It appears as if P Richardson will likely not be offered a deal by the team but I suppose that will in the end depend upon the strength of his market as will be the case with Sheldon Richardson. Thorpe was thought to be a solid ST guy so I could see him staying depending on where his health is seen to be. The whole kicking game is certain to be under forward evaluation at each point of the process. Last edited by jammerhawk on Thu Mar 15, 2018 10:33 am, edited 1 time in total. I moved DeShawn Shead back to the roster as technically his contract for last season apparentl tolled. However, he will be released today so the news seems to indicate. He will likely be moved to releasedthis afternoon or whenever his release is announced. I wonder if he is treated as a UFA for potential comp pick purposes when he is released. Does anyone know? The motives for this release may be for less that altruistic reasons as Shead may have been able to argue that his contract should not have tolled and he was ready to return from PUP earlier. In the end I suppose that distinction won’t mean that much. jammerhawk wrote: I moved DeShawn Shead back to the roster as technically his contract for last season apparentl tolled. However, he will be released today so the news seems to indicate. He will likely be moved to releasedthis afternoon or whenever his release is announced. He wouldn't be counted towards any comp picks unfortunately as he's being released. The team have basically put him first before themselves in this situation. I suppose so, and expected that he wouldn’t count for a comp. pick. As earlier indicated while this looks as if the team was just being nice to Shead, they avoid a complex arbitration and player unhappiness by real easing him despite the tolling of his contract. The Seahawks will keep one of their own free agents. They’ve agreed to terms on a three-year, $13.95 million deal with S Bradley McDougald, source says. He stepped into a starting role last year when Kam Chancellor went down. Chancellor’s future remains murky. Rostermon.com says DeShawn Shead is now waived. Team extends a 2nd Rd. RFA tender of $2.97 million to CB- Justin Coleman. This was an expected move. I will list him as a signed player for now. We will need to wait to see if other offers are made for him. Last edited by jammerhawk on Tue Mar 13, 2018 10:19 am, edited 1 time in total. I'm surprised they didn't chuck Dion Jordan on at the same time, maybe they're planning on extending him instead. I suppose so, but we may see Jordan tendered as expected today. The Coleman news came late in the day and it perhaps was their response to all the losses/cuts at CB. Jordan won’t exactly be hot in demand at this point so they could just extend him. McDonald, Dewey LB California, Pa.
2 years $6.8 mil., $3.2 million guaranteed. Last edited by jammerhawk on Wed Mar 14, 2018 3:14 pm, edited 1 time in total. No real surprises among the ERFAs that weren't tendered except maybe Garrison Smith - I think he's the only one not tendered who had any significant playing time (9 tackles in 8 games). I found that interesting about the non-tender to Garrison Smith as well but perhaps they plan on acquiring another similar player and he is surplus to need. Another player that bears watching is the nontendered RFA OLB- Dewey McDonald who the team is still high on but wants to re-sign cheaper than the tender ammount. McDonald was traded for two seasons ago and was active as a ST player mostly and effecticve for us when he played. To me Mingo is an interesting add, thre is geniuine physical ability and less developed football ability. he was a first round pick that hasn't panned out but he has bulked up some and hopefuilly hasn't lost his speed. Hopefully he can be coached up and demonstrate some of the potential that got him drafted in the first round. The NFL website has updated the draft order to reflect the picks exchanged between SEA and PHI in the Michael Bennett trade. As it turns out, we're simply re-exchanging the same two picks that were swapped in the Matt Tobin trade. We're getting our 5th rounder back (#19 overall in the round) rather than PHI's own 5th rounder (#32), and we're sending PHI their original 7th rounder back (#32 in the round) rather than one of the two higher picks that we also own in the 7th round (the Jets pick at #8 and Minnesota's pick at #30). So the Hawks maximized the move-up there, going from the end of the 7th round to the middle of the 5th. Seahawks spent a total of $13,629,333 on 9 players yesterday (at least as far as the cap is concerned, actual cash is more). Hey OP what do you think the real number left is now? OTC.com says it's $19,938,267 but your calculations would seem different from that. OTC number is wrong. (they haven't accounted for the ERFA's yet). That number also accounts for there currently being 53 on the roster and the cap only accounting for the top 51, too. Thanks OP, your numbers are interesting indeed. I will stick with OTC for the thread as they historically have done the best reporting the cap and it’s hard to fault them at this time of year for being completely current with all 32 teams. For sure the rule of 51 would apply to their calculations. The numbers are always subject to some debate as contracts can be varied quickly, and right now the changes are frequent. Yeah can't knock OTC, fantastic website. I struggle keeping on top of one teams cap position, let along doing it for 32. Hats off to Jason and the guys over there! As soon as they add the ERFA guys to the list their number will be pin point accurate in line with mine. Sure has been a significant roster churn. However, it was overdue by at least a season. I fully expect Thomas to be gone too b/c the are not going to pay him the reported $55 mil deal he seens to be seeking. Change is good, change is good, whistle a happy tune. lots of good pieces here still. Thanks my friend! Akeem King was tried out last season on the PS as CB. He fits the standard physical profile Pete prefers for a CB. Him playing S wouldn't be much of a stretch. You might say he has a nose for the ball and works for food. Nope. Since they signed Ed Dickson, Richardson is now canceled out. No comp pick at all. As I mentioned in the "comp pick situation" thread, the Seahawks are currently down to one comp pick due. However, once other teams sign some more of our UFAs (very likely), we will recoup some of our comp picks, including (likely) the 4th round pick for Richardson. Seahawks trade a 2020 conditional 7th round pick to The Brown for CB- C J Smith. Brady Henderson from ESPN came out with exactly the same number for the 2018 cap hit, too. Seahawks sign OG/T- DJ FLuker. Contract believed to be for 1 year, terms unknown. jammerhawk wrote: Seahawks sign OG/T- DJ FLuker. Jaron Brown cap hit in 2018 is - $1,775,000. All guaranteed. You should start a cap thread.your information posted on this site as far as the cap,and the future with the cap is worthy of it’s own thread. JS has a plan that will give flexibility next offseason. Contract structure which seems back end loaded is playing towards that reality. All in all there is some genuine talent and much demonstrably unproven talent on the roster at present. The team is now in fair shape as far as the cap but struggles with the numbers of signed players. To me this may be an unintended negative hangover of one year contracts which while presenting opportunity for comp picks leaves the team looking for players to raise the nipumbers to 90. This sadly conflicts with the comp picks as necessity requires signing FAs.